Nola Merrill longed to leave her small hometown in Oklahoma long before the Dust Bowl first barreled through. But her husband, Russ, is the town’s preacher, and maintains that they need to keep their family rooted in the community. To Nola, everything is slipping away–she once dreamed of going to college and having adventures–twelve years after their hasty marriage, Nola and Russ have two children, they live above a shop that makes no money, and Nola watches everyone and everything in her landscape drift away or die. When Russ’s old friend Jim comes to stay with them, Nola is reminded of her desires and is further troubled with discontentment. Jim stirs feelings of adventure and romance in Nola as the two of them plan clandestine meetings to read novels. Nola knows she needs to distance herself from the sinful relationship, but continues to seek Jim’s attention. As Nola’s desire for change grows, and as she shirks her inner voice telling her to plead for help, Nola slips further into an affair and even further from the contentment she seeks. With an unspoken secret between them and the constant threat of dust storms wreaking havoc on their nearly desolate town, Nola and Russ drift further apart, making it increasingly difficult for Nola to find forgiveness. As a historical fiction novel, On Shifting Sand presents great insight into the lives of Americans living through the Dust Bowl. Pittman includes plenty of historical detail in the novel, including the preventative measures people took to keep dust out of their homes, the ailments that plagued them, popular culture of the day, and an overview of the lifestyle. The story is written in clean, descriptive language. Infidelity is not a common topic in Christian Fiction. Rather, it is something shied away from as too messy and too sensational to talk about. Pittman does a thoughtful job negotiating this delicate topic with honest first-person narration that never slips into graphic explanations of sexual encounters. Nola’s story is an important story to tell. Within the Christian community, people are suffering from the ramifications of adultery, reeling from the loss of trust and the shame. Nola’s story, as well as Russ’s, gives readers a powerful insight into the nature of infidelity–the seeds that plant it and the ways it is nurtured into something even more destructive. While Nola’s discontentment with her living conditions is understandable, the reason for her attraction to Jim is not well-developed. The reader is told they read together and have lengthy, personal conversations while the family is away, but does not actually witness much of this. Nola is suddenly infatuated with Jim with little reason. Thus, Nola’s character is oftentimes unsympathetic. She continually puts herself in emotionally dangerous situations while ruminating on the potential pitfalls, which also makes the plot circular and redundant. Nola’s marriage to Jim is ultimately meant to be a positive example for readers. However, Jim often makes decisions for the family without consulting Nola, decisions that directly impact their family’s well-being. This may be a character-flaw or a product of the setting in which the story takes place, but Jim often comes across as domineering and apathetic. With the subject of the novel, some of the content may not be appropriate for younger readers. There is no graphic sexuality, but there are thematic elements including dark emotional content and some innuendo. 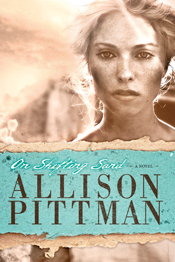 On Shifting Sand is a powerful read for those who have dealt with infidelity. Pittman often brings the reader back to the example of Christ’s love for His bride, the church, and His unfailing love for her. You can get a copy at Tyndale House Publishers or at your local library! Pittman, Allison. On Shifting Sand. Carol Stream, IL: Tyndale House, 2015. Print.